Seriously, this day was perfect. I retired at 50 (I should tell you about that sometime, it's quite a story) and now I'm kind of living my dream in many ways. Well, now I feel I have to qualify. I do consulting work, but on my terms. Also, we're still planning to build and operate a horse facility next year, so that is going to be LOTS of work. 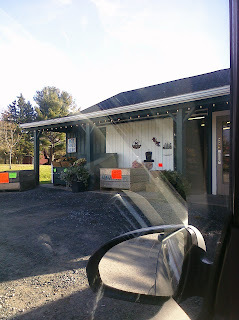 I stopped at Avery's Farm Market on my way to Fraser Equestrian Center to buy a bag of 'drops and culls'. $5.99 for a 20 lb. bag of delicious apples. 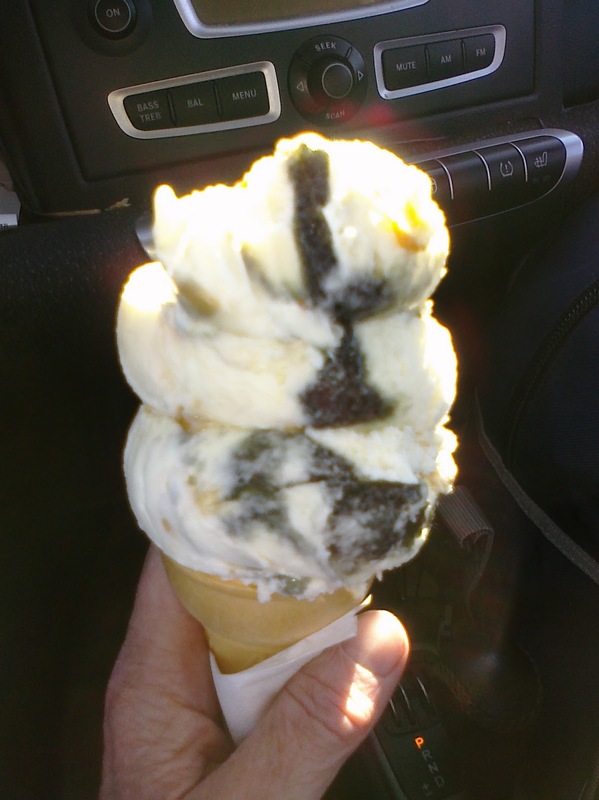 Although it was about 9:45 on a Monday morning, I thought why not have a cone of my favorite icecream - Privateers Bounty? Have you tried it? It is utterly addictive. Licorice and salted butterscotch chunks. I don't even like licorice but this combo is deadly delicious. Sue had us work on good basics, forward being the most important. Rogo still needs to learn to go forward automatically without nagging, and I need to learn to ride him forward without nagging him. A quick and if need be sharp correction, and then relax. Repeat as necessary. I'd much rather do this than be picking at him, but I need to train myself to do it. I don't even realize I am picking at him to keep him going, so having Sue there giving us instruction and feedback about this is awesome. If he learns to go forward easily everything else will be SO much easier. forward. There's an art to this and I don't have it. The aid needs to be delivered at the right time in the stride and without interrupting our connection. I'm clumsy at it, but will learn. I don't want this to sound harsh - I'm not wearing spurs and Rogo isn't at all put off by it. It's an impulse forward and as I learn to time it correctly and he learns to respond, the need for it will decrease. I thinking I'm heading to weaning off of my whip and onto my legs more. Ultimately of course a very light aid is the goal. So, just to repeat the key point - I need to stop an almost constant light aid and give a firm aid only as needed. I know this intellectually already, but haven't succeeded in doing it. Sue will keep us on track. We worked on walking a three loop serpentine from quarter line to quarter line. Then we trotted it. It's challenging, because without the wall as a crutch any holes in the training show up easily. Can you guess Rogo's? He did this quite well in many ways, changing bend and staying precise when I guided him correctly, but we're still weak on the left leg into the right rein. He almost ignores my left leg. This is an area for attention for sure. Maybe I'm making it sound worse than it was. He bent correctly most of the time, but he's definitely hollow going left. We did trot figure eights and they went fairly well, but of course there's the same issue re hollowness. So, day one conclusion? More forward, and get him attentive to the left leg. I'm loving having lessons with a good teacher!!!!! As I mentioned, Rogo and I will be here at least until the end of December and we'll have three lessons a week with Sue. 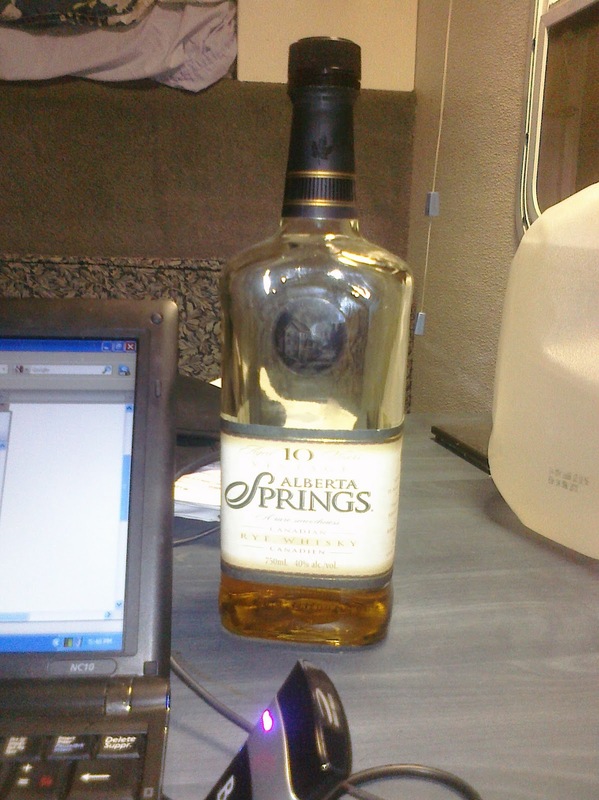 I'll stay overnight in the trailer one or two nights a week. I'm in the trailer tonight and loving it. It was 16 C. today! 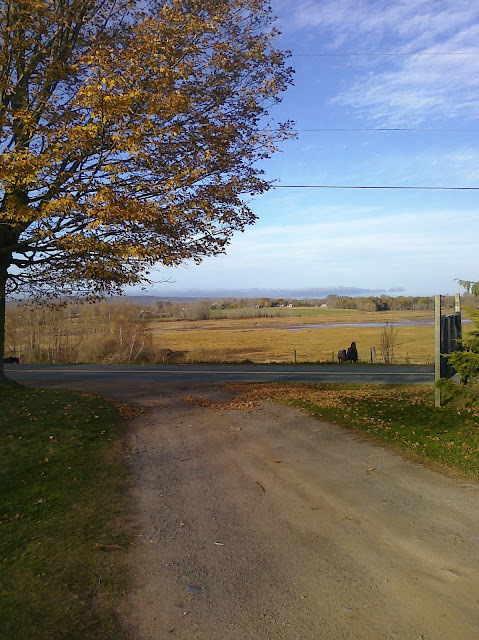 Looking out over the marsh from Fraser Equestrian Center. Can you see how smokey the hills in the background look? It's beautiful here. My smart car parked on front of our trailer. I sat outside in the sunshine reading a dressage book after riding. My good friend Verna gave me this Canadian whiskey when she was here visiting from Alberta in Oct. Just the thing for a November evening. A final note - Rogo's lab work results arrived today. His tumour was confirmed as a sarcoid and the edges of the piece removed were free of cancer cells, meaning there is less chance of a recurrence. Keep your fingers crossed for us. Does sound like the perfect day! Glad the sarcoid removal went well - that's a relief. To get forward, I try to feel the rhythm I want the horse to use in my own body, and if I don't get a response with the aid I want to end up using, I go immediately to a secondary aid (say a crop on my leg) so that I don't train the horse only to respond to a stronger primary aid. It sounds like you had a great lesson! And I'm incredibly jealous that you are retired. I'm 51 and still working full time. Sounds like a great lesson. Lots of good stuff to work on. I feel like I can learn great things reading your blog. Once I send my horse forward, he doesn't usually stay forward and I feel like I need to push his every stride. And our judge's comments always say "more forward!" But that's what I get for trying to re-train after our days of showing western pleasure etc. on the QH circuit. I'm glad the sarcoid removal all went ok.
Carol, What a wonderful day!! Sounds like a great session with Rogo. You will learn a lot because you are so enthusiastic about learning! 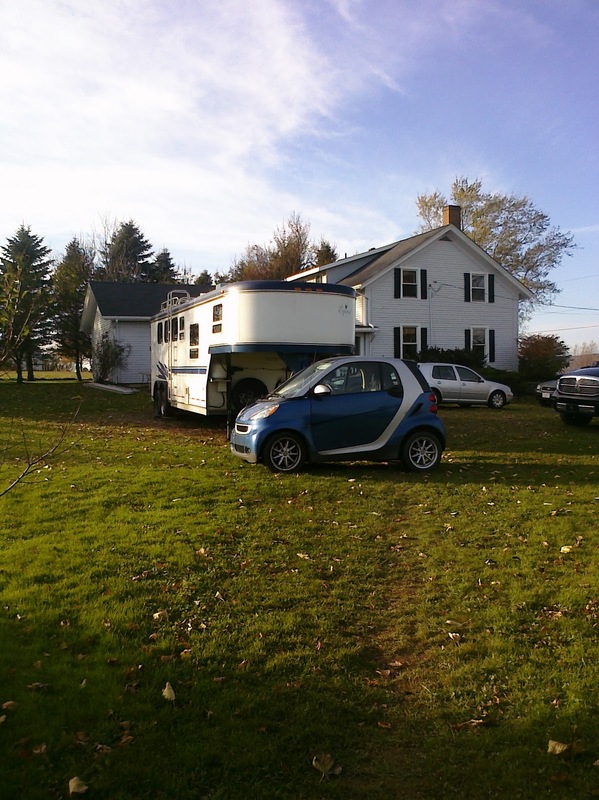 I love the photos- especially of your cute car! I'm glad Rogo's surgery went well and he is back to his old self (including the- I love how you put it- running out which gave us the chance to have a discussion about who is in charge). What a good work ethic he has! Carol...just caught up with the last several posts. Happy to read that Rogo is doing well and that you are just about ready to ride him again. I so envy you opportunities to ride on a beach. About next year and the boarding business...did you settle on a place? Carol, I always enjoy reading your posts about lessons because you write very well! So much of your lesson sound like my first lesson last week with my new trainer. With me though, it is nagging with spurs - and I want to work toward losing these and the nagging. My trainer uses 3 quick whaps (don't know how else to put it!) with her legs to correct - and it certainly gets their attention. Great news about the sarcoid! Sounds like a great lesson, wonderful to have such a good instructor and in such a beautiful place. I am jealous too and many years away from retirement (if that ever happens!). I liked your serpentine off the rail exercise. Definitely keeps one honest. 16 C! I'm jealous - it's already below freezing with snow in Winnipeg. I've switched to winter riding boots and they feel like Sorrels in my irons. I know I need to get Handsome to consistently give me a good, forward trot. And I know I nag. Thank you for blogging your lesson - I always find these posts to be good reminders and motivators for me! Yay! I'm so excited for you. Sounds like you had so much fun. :D And I'm glad the results on Rogo's sarcoid are so great!! Can't wait to read about your next lesson.